Building your own DIY concrete block planter not only looks fantastic, but you can get super creative with it, and come up with your own unique design. It’s also versatile, so you can put it anywhere – and make it as small or large as you need to fill your space. 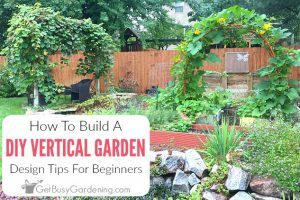 It’s also wonderful way to try your hand at growing vertically, and is excellent for adding height to a boring empty corner like mine. Another thing I love about this project is that it’s a wonderful option for anyone who’s on a budget. Concrete landscape blocks (also called cement blocks or cinder blocks) are inexpensive to buy and easy to find at any home improvement store. How Much Does It Cost To Build A Concrete Block Planter? 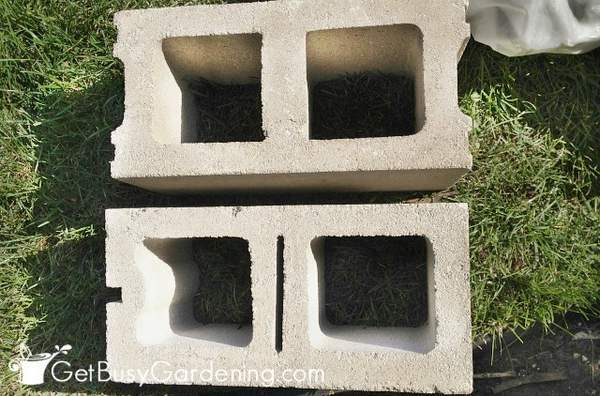 The cement blocks were only $1.00 each; which came to $16 total for my block planter design. I needed more dirt than I expected to fill the large planter, and the dirt ended up costing almost as much as the concrete cinder blocks (see my note about how to save a few extra bucks on dirt below). But I still built the entire concrete planter for under $30, an amazing price for this large of a planter! 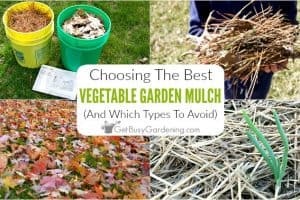 I saved money by using plants that I already had in my garden, so you’ll also need to factor in the price of plants if you’re working on your project budget. 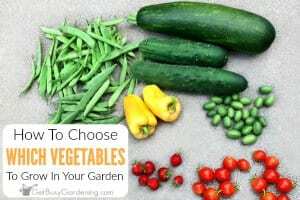 Otherwise, just do what I did and take divisions of plants from your garden to fill your cement block planter. 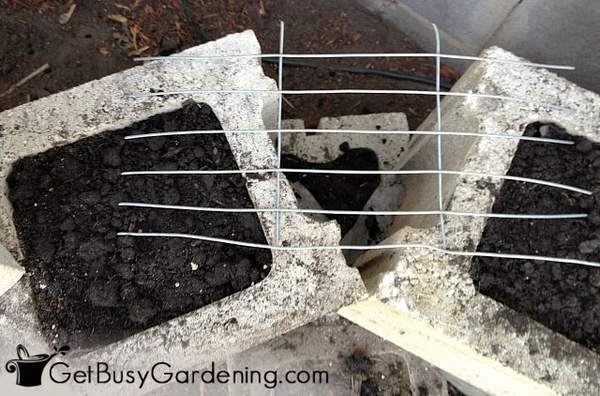 Before getting started making your own concrete block planter, keep in mind the blocks are very heavy. I must have moved each cinder block at least ten times in the process of building my planter, and my back was sore the next day! I wanted to be sure to mention this to you so you know what you’re getting yourself into. I didn’t think about this when I decided to make mine. Also, if you need a lot of blocks, you’ll probably need a truck or trailer to transport them since they are so heavy (and be sure to bring work gloves to the store with you to save your hands when loading them up). I was able to get mine home in my car with a few different trips to the store (which is less than a mile from my house so it was easy for me). 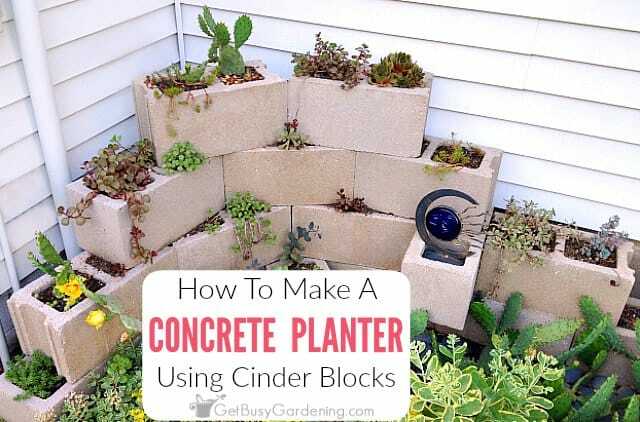 Step 1: Figure out your cinder block planter design – If you have an eye for design or any artistic ability, then you can draw your planter design on paper before you even lift your first block. Even if you’re not artistically inclined, it’s still a good idea to sketch something out on paper and take some measurements of the area so you have an idea of how many cinder blocks you’ll need to buy. Step 2: Lay out your planter design – Once I got the everything home, the first thing I did was set up the blocks to create a design I liked. I was hoping to come up with a really cool design, and I wanted my cinder block corner planter curved so that made it more difficult. I recommend taking the time to lay out your blocks in the design pattern before you build your planter. It’s heavy work, but it’s worth it to make sure you like it before you build it. At this point, you’re just stacking the blocks to get your basic design laid out. Don’t fill any of the blocks with dirt yet, we’ll do that in a later step once the design is final. A quick note about different types of cinder blocks… Once I started putting the design together, I noticed the concrete blocks I bought weren’t all the same. Some have a flat end (bottom block in picture below) and some have ridges on both ends (top block in picture). This didn’t affect the way the blocks went together, but I had to pay attention when I built my planter so the flat ends of the blocks faced the front of the planter. 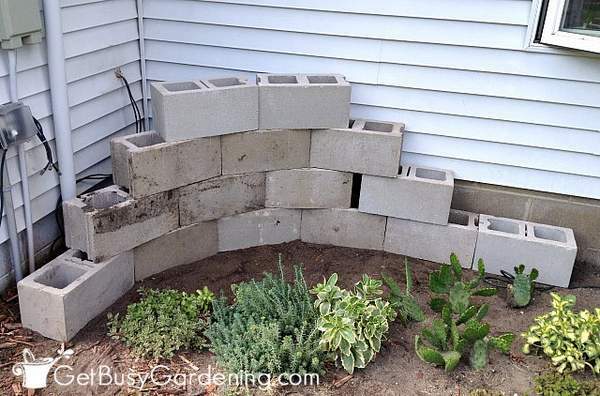 If I build another cinder block planter, I will pay attention to the blocks when I buy them to make sure they are all the same so I don’t have to worry about which blocks go where. Step 3: Take a picture of your design layout – I played around with different block placements until I figured out the basic idea of what I wanted my decorative concrete block planter to look like. Once you have your blocks laid out, be sure to take a picture of your final design layout. Step 4: Lay the first row of blocks – Once the design was done, I disassembled the blocks and started building the planter. 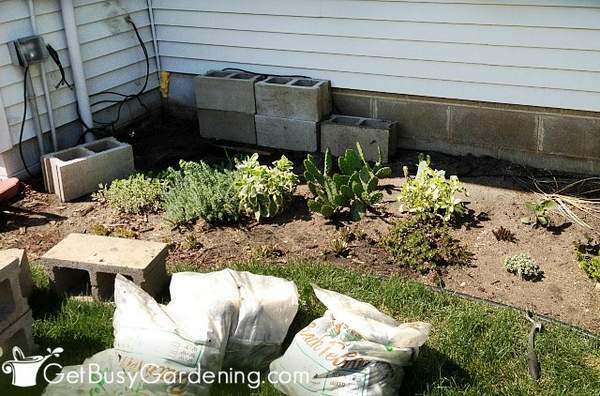 The first row of block takes the longest to lay because the cinder block planter bottom must be completely level – so be certain to use a level as you lay the block. This is super important, so don’t rush or skip this step! If your first row of blocks isn’t completely level, then your planter will be lopsided – and not only will that look bad, it could end up being very dangerous! You don’t want your planter falling on someone! So take your time and make sure the bottom row of blocks is completely level. I recommend using a tamper tool to flatten the ground, which makes quick work of leveling the block (actually, I don’t know how you would even do it without a tamper)! Once the ground is level, tamp down some paver base over the top of it to create a solid foundation for the bottom row of blocks. Once you get the first row level, the other rows will go faster since they can simply be stacked on top of each other. 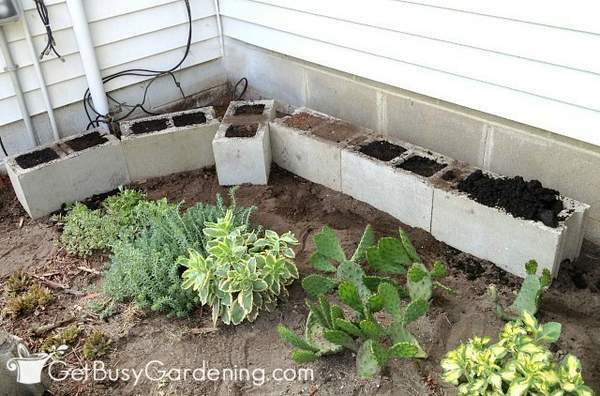 Step 5: Fill the planter blocks with dirt – Once the bottom row is in place, fill the planter blocks with dirt. I recommend waiting to fill the blocks with dirt until you’re done with the whole bottom row. Cement blocks filled with dirt are a pain to move and re-level! Trust me, I learned that the hard way. Another lesson I learned the hard way (and realized after I finished my planter) was that most of the blocks on the bottom won’t have plants growing in them. Of course, I bought high quality potting soil for filling the planter. So, if there are blocks in your planter that won’t have any plants growing in them, save yourself a few extra dollars by filling those with cheap fill dirt rather than high-quality potting soil. Step 6: Add extra support under the corners – After adding the second level of block to my corner planter, I discovered that my curved design created gaps that made filling some of the planter holes impossible because the dirt would just fall out the bottom. Oops! If your concrete block planter is square, you won’t have to worry about this step. But if you copy my design and build a curved corner planter, then you’ll need to figure something out for this step too. My solution was to take some wire garden fencing (chicken wire would work too) and lay it across the gap under the block for support. Then I laid landscape fabric over the wire fencing, and placed the block on top. Whew, that did the trick! 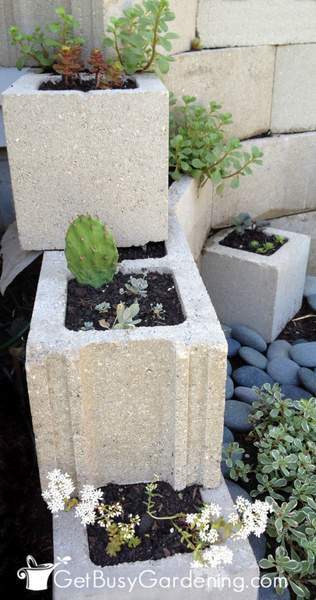 Step 7: Add plants to your concrete block planter – When my planter was done, I filled it with zone 4 hardy succulents. Once they fill the planter and cascade over the sides, it’ll look even more amazing. One thing to note about using concrete blocks for planters like this is that the cement can cause the soil to dry out very quickly. The corner where I built my cinder block planter is one of the driest and hottest corners of our yard. So that’s why I filled my planter with hardy drought-resistant cactus and succulent plants. You could paint the cinder blocks on your planter to help hold the moisture in (and add a nice decorative touch), or you could install an inexpensive drip irrigation system to your planter to help keep it consistently watered. 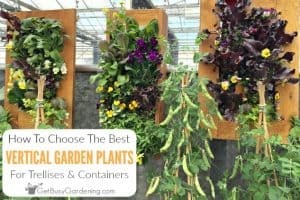 Whatever you decide to do, just make sure that you fill your planter with the right plants that will thrive in the spot where you build your planter. I am thrilled with the way my cinder block planter turned out, it’s perfect in the corner of my succulent zen garden, and does a great job of hiding the ugly corner! I get tons of compliments on it, and it will last for many years to come. Plus, since the plants are hardy perennials, I won’t have to replant it every year! Just remember, building a block planter isn’t difficult… but it does require heavy work. So make sure you are up for the manual labor, or recruit some muscles to help you (ehem, hubby?). 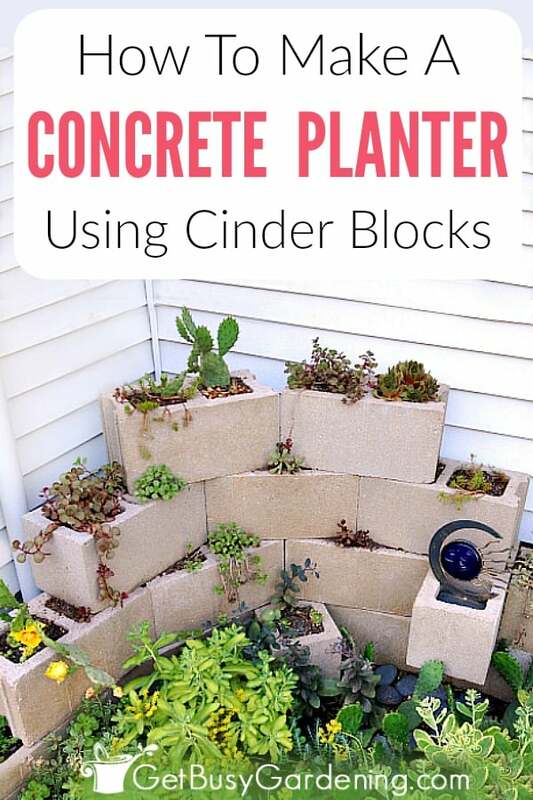 Share you tips for building a DIY cinder block planter in the comments section below. I noticed this wall when you posted previously about redoing this area. Thanks for the step by step on building the cinder block planter. I'm sure that in another year or two it will look fantastic with everything spilling out of its container. Thank you, I'm glad you like it. I can't wait to see what it looks like once the plants take over! This is an amazing idea! I just love it! Thanks for posting it. Cleaver. Be sure to post pictures when the plants fill in! I can't wait for that and I will definitely post pictures! Looking good Amy. 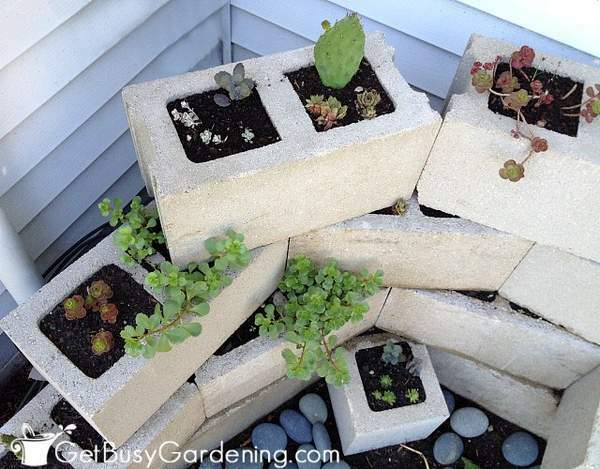 Your cinder block planter looks great. Isn't funny what you find out you didn't think of before you start a project. LOL. Great job, Amy. I love what you did. It had to be a little tiring, all that heavy lifting but the end result is so worth it. I hope you'll take another photo after the plants fill in. Thank you! Building the planter was hard work, that's for sure. But you're right, totally worth it. I'll definitely share pictures once it fills in. i have one question though ..
how do i prevent the soil from falling through the block for those blocks that are protuding ? I just put a decoration in mine, and thought that looked nice. I have seen tutorials where they cut a piece of concrete block to fit in the bottom of the opening, and then glued it in using a special glue. Love this idea also! I plant Herbs in cinder blocks..(keeps them contained.) To stack..I put them side by side, with a gap between them, and where the gap is, I put one the long way. I would send pictures of how, but I have a broken Femur and in a wheelchair for the next 3 months. Your cinder block herb planters sound nice! Hope your leg heals quickly, and you’re back on your feet in no time! You list a “Paver Base” in your supplies but don’t say what it is or how you used it. Ha, you’re right! I just added it to the instructions. Thanks for pointing it out.